If you follow the Guardian or the New York Times, or any major news network, you are likely to have noticed that a company called Cambridge Analytica have been in the headlines a lot. A shady UK data analytics company, with the help of a 24 year old tech genius developed an innovative technique to ‘hack’ facebook and steal 50 million user profiles. Then they used this data to help the Trump and Brexit campaigns psychologically manipulate voters through targeted ads. The result was Vote Leave ‘won’ the UK’s Brexit referendum and Trump was elected president in the US. A recent in-depth article in the New York Times dug into the controversy surrounding Amy Cuddy, the research on ‘Power Poses’, and subsequent failures to replicate the research. The piece by Susan Dominus was nuanced and provided a decent summary of the criticisms leveled at the research and how it was oversold. However, the primary goal of the article seemed to be in offering a sympathetic profile of Cuddy, detailing her sincerity/professionalism, and highlighting that some of the attacks she had received veered into abuse, bullying, and misogyny. Sears’ videos are often funny and witty and have proved popular with skeptics and rationalists because they effectively lampoon various fad diets and new age spirituality, highlighting the hypocrisy and logical leaps made by supporters. This has led many to assume that he is a comedian with a critical thinking or skeptical bent. Unfortunately, this seems to be an unwarranted assumption. The first warning flag is that Sears not only lampoons new age spirituality and self-help, he also is a genuine life coach (about to launch a premium subscription service). Reposted from the article I wrote for Aeon (published 11th May 2016). Easter Island, also known as Rapa Nui, is an island in the Pacific famous for the massive humanoid statues peppered along its coasts. These moai are commonly called stone heads, but actually most possess bodies, and the largest constructed stands at over 30 feet and weighs 82 tons. Ever since these monoliths were encountered by European explorers in the 18th century, the history of the island has been a topic of fascination and debate. Most captivating is the mystery of how almost 900 moai were carved and transported, mostly between 1250 CE and 1500 CE, only to be toppled and abandoned by the 18th century. 2016 has been quite a busy year for me. The first major milestone (and one four years in the making) is that I submitted, successfully defended, and completed the requested minor corrections for my PhD thesis. 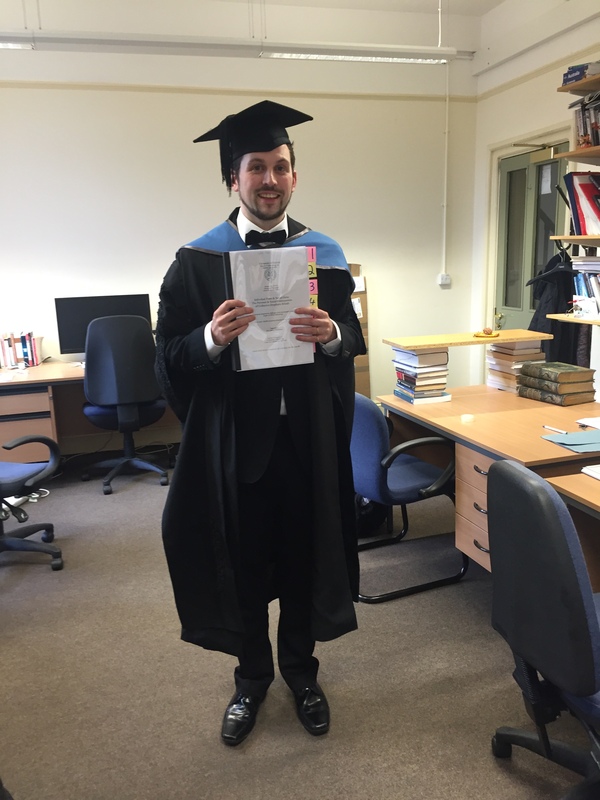 So I am now done with my DPhil at Oxford and have become Dr. Christopher Kavanagh. All I have left is the official ceremony to attend (which I will do in November) but there is no more work to be done on the thesis. As you can imagine this is a pretty big deal for me and one that I am still internally celebrating, although externally nothing has really changed in my day-to-day life. The next noteworthy development is that I managed to secure a post-doctoral research position at… (wait for it)… Oxford! Yes, that’s right, I am staying exactly where I am and continuing to work as a member of the Institute of Cognitive and Evolutionary Anthropology (ICEA) f0r at least the next three years. More specifically I will be continuing to work with my PhD supervisor, Harvey Whitehouse, as a coordinating researcher on a large scale ERC funded project that is set to examine rituals and their effects on people using a diverse range of approaches. Location wise I will remain primarily based at Masaki Yuki’s social psychology lab in Hokkaido University in Sapporo but will be travelling about to field sites/meetings outside Japan as and when is necessary. So that’s what has been going academia wise. Now before the new project kicks off in November I am working hard to finalise a bunch of journal articles based on data from my thesis and also finishing up some older papers that I had put aside during my PhD studies. In terms of blogging I have been much less productive. I was kindly offered the opportunity to start a new blog over at Patheos which I did and you can find here. It’s called Cognitive Demons and it addresses very similar topics to what I was writing about here, minus the more personal political commentary. However, you might also notice that I haven’t exactly been consistent with my posting there- which is a shame and something I am hoping to rectify. And this leads me to the issue of what to do about this blog. I have a strong attachment to this blog not just because of how long I’ve had it but also because this remains my own space where I have complete independence and do not need to be concerned with things like ‘for profit’ copyright restrictions. This is not to suggest I have experienced any problematic editorial oversight at Patheos but it is still the case that this space feels more like my personal ‘home turf’. When I joined Patheos I checked if it was possible to ‘cross post’ my content so that the blog here wouldn’t languish without any content updates for months and was reassured that there was there no issue with doing so. Unfortunately the only thing I failed to factor into my considerations was whether I would remember/be motivated to do so myself and it seems that this was really the only crucial factor. With that mea culpa I am now giving notice that over the next few days I will be migrating a copy of all of the existing Cognitive Demons content over to here. My goal in doing so is that I would still like to maintain one location where all of my dispersed writing can be collated and easily referenced, regardless of where I end up writing and blogging. You might also remember that I was previously attached to the Genealogy of Religion blog run by Cris Campbell. The website has been dormant for over a year and I haven’t heard from Cris so I’m guessing that he also has gotten a bit snowed under by his academic work also. If so he has my sincere sympathies but whatever the case I won’t be posting on the site for now so just a in case you were wondering update. I’ve also been writing some articles for Aeon- a website that hosts short and long form essays and documentaries. I just recently wrote a long piece about definitions of religion, ‘religion’ in Japan and the widespread bias of focusing on beliefs rather than practices. I’m pretty happy with how it turned out and the response it garnered. If interested you can check it out here: Can Religion be based on ritual practice without belief? I also wrote a shorter post about the debates over Easter Island: The Easter Island controversy has no single simple answer. So that’s how things stand right now. Any questions or things you are wondering about feel free to ask in the comment section but expect updates and content to start appearing again over the next few days.